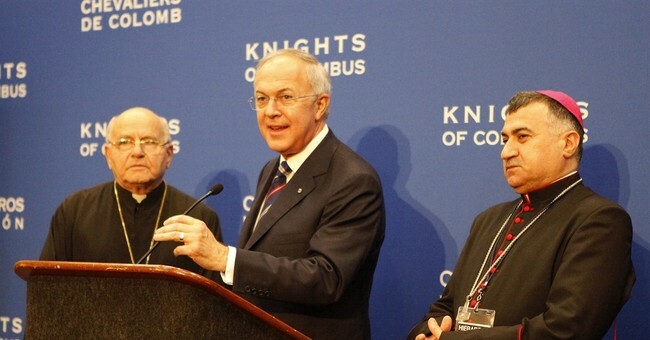 Washington, D.C. - Carl Anderson, the head of the Knights of Columbus, spoke with Townhall Friday during the March for Life about the scrutiny that judicial nominee Brian C. Buescher faced over his membership in the Catholic charitable organization. In written questions submitted in December, Sens. Mazie Hirono (D-HI) and Kamala Harris (D-CA) expressed concern over the group’s support of defining marriage as being between a man and a woman and the group's opposition to abortion. These positions are both official teachings of the Catholic church. Anderson told Townhall that he was “greatly surprised” by the senators’ scrutiny and referenced similar criticism that a Democrat, and member of the Knights of Columbus, former president John F. Kennedy had faced decades ago. Anderson highlighted the charitable focus of his group, citing the 187 million dollars they gave to charity last year and the 85 million hours of volunteer service. Asked about the scrutiny that Second Lady Karen Pence faced for teaching art at a Christian school that requires their students and teachers to adhere to a Biblical understanding of marriage, Anderson talked about the current of animosity towards such ideas. Anderson praised the unanimous consent resolution that Sen. Ben Sasse (R-NE) introduced and the Senate approved Wednesday. Sasse described the resolution as reaffirming “our oath of office to a Constitution that rejects religious bigotry" and honoring a Constitution that "explicitly rejects religious tests for federal office." Anderson said he was “very happy” with the resolution. A Marist poll, released Wednesday, found that the vast majority of Americans don’t think religion should be a factor in appointment to federal government jobs. The survey of 1,066 adults was conducted January 8 through January 10, 2019 by The Marist Poll, sponsored and funded in partnership with The Knights of Columbus.